XV. The recent Eclipse Results and Stokes-Planck's s AEther. By L. Silberstein, Ph.D., Lecturer in Mathem. Physics at the University of Rome*. 1. 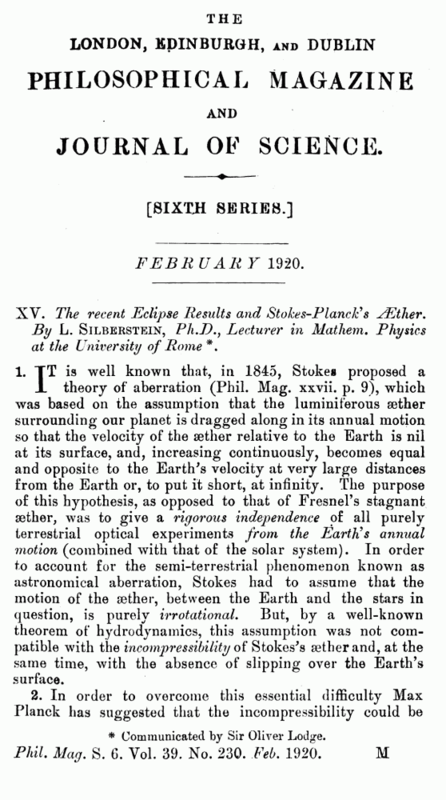 IT is well known that, in 1845, Stokes proposed a theory of aberration (Phil. Mag. xxvii. p. 9), which was based on the assumption that the luminiferous aether surrounding our planet is dragged along in its annual motion so that the velocity of the aether relative to the Earth is nil at its surface, and, increasing continuously, becomes equal and opposite to the Earth's velocity at very large distances from the Earth or, to put it short, at infinity. The purpose of this hypothesis, as opposed to that of Fresnel's stagnant aether, was to give a rigorous independence of all purely terrestrial optical experiments from the Earth's annual motion (combined with that of the solar system). In order to account for the semi-terrestrial phenomenon known as astronomical aberration, Stokes had to assume that the motion of the aether, between the Earth and the stars in question, is purely irrotational. But, by a well-known theorem of hydrodynamics, this assumption was not compatible with the incompressibility of Stokes's aether and, at the same time, with the absence of slipping over the Earth’s surface. * Communicated by Sir Oliver Lodge. Phil. Mag. S. 6. Vol. 39. No. 230. 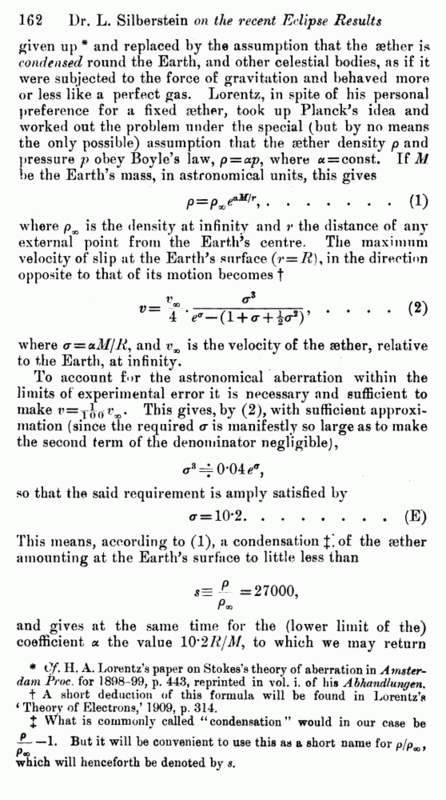 Feb. 1920.
where a = otM/R, and is the velocity of the aether, relative to the Earth, at infinity. * Of. H. A. Lorentz’s paper on Stokes’s theory of aberration in A mster-dam Proc. for 1898-99, p. 443, reprinted in vol. i. of his Abhandlungen. t A short deduction of this formula will be found in Lorentz’s 1 Theory of Electrons,’ 1909, p. 314. --1. But it will be convenient to use this as a short name for p/p . which will henceforth be denoted by s.